By now you have heard us say it probably. We need $400 in order to file for "charity" status. What on earth are we talking about? Well, we completed the filing necessary for IRS non-profit status back in September. That part is done. It was free to obtain an EIN and to request to file our taxes as a non-profit organization. Yes, we are ALREADY an official Non-Profit Organization. money comes in, then it goes right back out, almost immediately. Everyone here is 100% volunteer. No one is getting paid. Not even the founder of the organization. There are very few expenses, actually it's just $10 per month for website expenses, and so far that is paid monthly from the founder's own pocket. 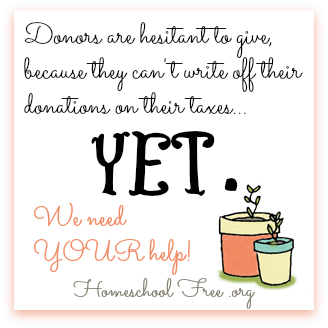 We're keeping detailed records and can show that 100% of donated funds are going towards providing curriculum to homeschool families in need. We're a young organization, but we've already assisted over 8,500 homeschool families to find each other in order to share resources for only the cost of shipping. We've also been able to give donors a chance to give BRAND NEW donations to families in need of their own choosing. Most importantly, we've grown into a community of people who love to help others and expect nothing in return. It's a beautiful thing! We continue to grow and word is spreading. And we could be doing SO. MUCH. MORE. because they can't write it off on their taxes. HSCFFS currently is collecting donations specifically to help fund the cost of filing for "charity" status with the IRS. To do so, will cost the organization a one-time filing fee of $400. The founder of the organization very simply does not have that kind of money. Simply click here to donate. Even $5 gets us closer to our goal. Please write us a little note on the donation comment section that says "for IRS charity status."